360 Degree Old-Timey Desktop Fan | OhGizmo! Fans are cool (get it?) and stuff, but they’re preposterously directional. You gotta sit in front to get any use from them or hope that you’re in the range of the oscillating ones only to get a couple of seconds of bliss. The Fargo 360 Degree Tabletop fan is omnidirectional. Horizontal blades draw in air from the top and fling it in all directions, creating a disk of air that’ll cool down your sweaty skin no matter where you’re sitting. 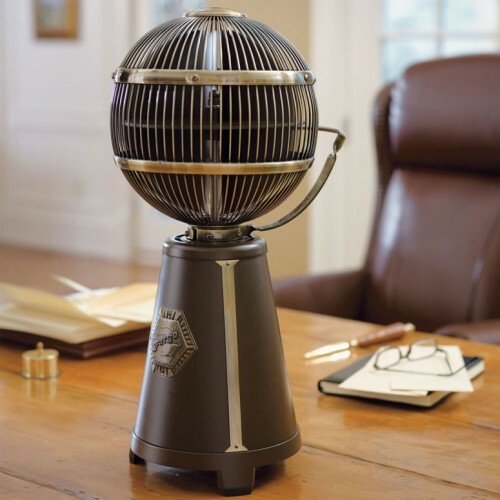 It happens to be done in the style of 1920’s banker’s fans with an oil-rubbed bronze finish with antique-brass accents. It’s not cheap, but it’ll sit pretty on your desk for around $250. This plus the desktop freestanding fireplace from previous post.